As an ASA sailing instructor, previous Scout waterfront leader and general outdoorsman I was shocked by this article. Not by what it said, because it makes immense sense, but the fact that all the references that we use to ply our trade of shaping Captains doesn't even address drowning. In fact the ASA states there are 3 stages to hypothermia while the medical community only recognizes 2 stages, you either are or you're not... On that note I have heard it said that most people don't drown, they get hypothermic then they drown... This is the best brochure I have found on hypothermia from State of Washington. We need to be the consummate expert to properly execute the Captain's role. Understanding all these facets that keep us, our crew and passengers ultimately safe has to be our first and unending priority. The below is an article by Mario Vittone, a leading expert on immersion hypothermia, drowning, sea survival, and safety at sea. His article is titled Drowning Doesn’t Look Like Drowning. How did this captain know – from fifty feet away – what the father couldn’t recognize from just ten? Drowning is not the violent, splashing, call for help that most people expect. The captain was trained to recognize drowning by experts and years of experience. The father, on the other hand, had learned what drowning looks like by watching television. If you spend time on or near the water (hint: that’s all of us) then you should make sure that you and your crew knows what to look for whenever people enter the water. Until she cried a tearful, “Daddy,” she hadn’t made a sound. As a former Coast Guard rescue swimmer, I wasn’t surprised at all by this story. Drowning is almost always a deceptively quiet event. The waving, splashing, and yelling that dramatic conditioning (television) prepares us to look for, is rarely seen in real life. This doesn’t mean that a person that is yelling for help and thrashing isn’t in real trouble – they are experiencing aquatic distress. 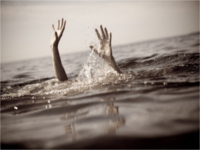 Not always present before the instinctive drowning response, aquatic distress doesn’t last long – but unlike true drowning, these victims can still assist in their own rescue. They can grab lifelines, throw rings, etc. So if a crew member falls overboard and everything looks OK – don’t be too sure. Sometimes the most common indication that someone is drowning is that they don’t look like they’re drowning. They may just look like they are treading water and looking up at the deck. One way to be sure? Ask them, “Are you alright?” If they can answer at all – they probably are. If they return a blank stare, you may have less than 30 seconds to get to them. And parents – children playing in the water make noise. When they get quiet, you get to them and find out why."